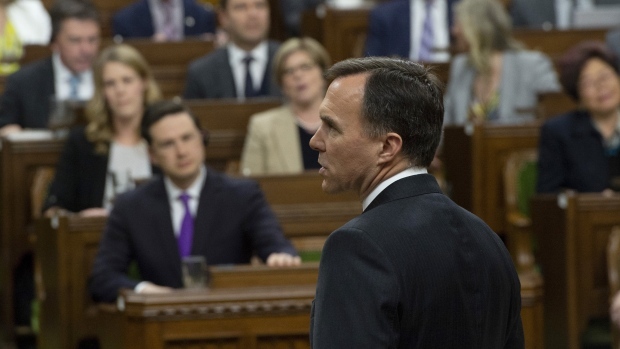 TORONTO -- Bill Morneau's fourth federal budget since the Liberals came to power in 2015 contained a variety of pre-election goodies, including many directed at seniors, when it was tabled last week in a raucous House of Commons. But a number of advocacy groups say Budget 2019 doesn't go far enough to safeguard members of private-sector pensions and they're lobbying all federal parties to include more retirement income protections in their election platforms. The big item is a new national employer-funded insurance program that would make up for shortfalls of any underfunded pension plans in the event the sponsoring employer goes extinct or can't pay its retirement benefits in full. Michael Powell, president of the Canadian Federation of Pensioners, says it would be ideal if Ottawa and the 10 provinces would "hold hands and create one program for all of Canada." But the retired General Motors Canada employee says federal officials "don't quite like the idea" because they don't think there's a big enough pool of capital in their jurisdiction. That's partly because some pensions are regulated by the provinces, with a large portion of Canada's defined benefit plans under Ontario's jurisdiction. Powell acknowledges that, historically, relatively few Canadian pension plans have failed to fulfil their obligations to retirees in full but notes Sears Canada and Nortel Networks are among the biggest and most well-known cases. "I agree, it's a very small number of companies. So why can't we fix it?" Powell asks. "Why can't we sit down and come up with a solution to this so the pensioners are not disadvantaged when the company goes through insolvency?" In fact, Morneau -- who dealt with pension issues during his pre-politics career at human resources firm Morneau Shepell before becoming Justin Trudeau's finance minister -- included several provisions for retirees in his pre-election budget. But the Canadian Federation of Pensioners, the National Pensioners Federation and their allies say the budget doesn't do enough to deal with underfunded defined benefit plans. That type of pension is supposed to provide a contractually defined level of benefits for the final years of their retired employees and their surviving spouses. "We were very pleased that a number of our key asks from our national platform were picked up," says Laura Tamblyn Watts, public policy chief for CARP, which lobbies on behalf of seniors. "We are really hoping, however, for a pension insurance plan that insures 100 per cent of pension liabilities. And this should be fully funded by the plan sponsors." "What we got instead is what I'd describe as 'good first steps' -- the details of which we're going to have to watch carefully." Trish McAuliffe, president of the National Pensioners Federation, says General Motors of Canada's underfunded pensions were one reason Ottawa and Ontario had to bail out GM a decade ago. McAuliffe, who was one of the unionized production workers at GM's main Canadian operation until the recession hit, says they had to give up their pension's cost of living allowance. "And that was a very hard pill to swallow. I think that was amounting to about $6,000 annually from our members," McAuliffe says. Even now, McAuliffe says she can't be sure that her current pension of $2,600 per month is safe. "Because GM is really contentious right now. What's going to happen to my pension?" While GM's pension falls under Ontario's jurisdiction, McAuliffe says the province's pension benefits guarantee fund is inadequate for Canada's national interests. For one thing, smaller provinces don't have the scale to make such a fund practical and for another, even the Ontario plan has a ceiling on how much it will pay per month towards an insolvent company's retirees. "It's a very complex system," McAuliffe says, whose federation represents about one million people across Canada -- either as individuals or as members of other organizations. "We would like to know that the federal government could lead the way and maybe cross jurisdictional (boundaries) to ensure the laws and legislation can be better-aligned." "It's something that I think is do-able with a national pension guarantee fund." Watts says CARP was pleased with a number of the budget's provisions -- especially a change in the guaranteed income supplement that will allow low-income Canadians to earn more money before their GIS benefits are clawed back. "This makes a big difference to older adults across the country and was one of our key platform asks," Watts says. She added that CARP is cautiously optimistic about the budget's provision for greater governance, transparency and oversight over the process when a company with a pension is in crisis and possibly headed to bankruptcy court. "And those protections we did get. Now the proof will be in the pudding." But Powell is skeptical of a promise to amend the Companies' Creditors Arrangement Act, the Bankruptcy and Insolvency Act and the Pension Benefit Standards Act -- purported to help employees and retirees defend their pensions in court. "The things they've got in their budget -- they're all positive steps. But they don't actually address the problem."